Gluten is a protein found in many different grains, including wheat, rye, oats and barley. Individuals who develop an allergy to gluten -- a condition called celiac disease -- are unable to consume foods containing this protein without enduring gastrointestinal pain, including diarrhea in some cases. Consequently, individuals with a gluten allergy need to monitor what they consume and avoid gluten-bearing products. This includes malt beverages. Malt is a product of barley, which features gluten. Malt is used in a variety of foods but is commonly used as an ingredient in beer. 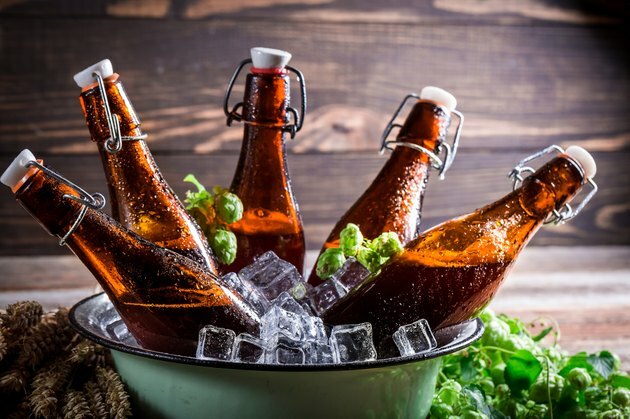 Some beers may feature only malt, while others might features a mix of malt and hops in varying proportions. Barley grains are soaked in water to germinate. From there they are taken to be used in various foods. The potential for gluten to be present in foods is a considerable threat to the health of anyone with celiac disease. Unfortunately, there is no way for malt beverages to have gluten extracted from them -- any nutrition label listing malt as an ingredient indicates a food that is not safe for consumption if you need to avoid gluten. Many different health risks accompany gluten consumption for individuals with celiac disease. Bloating, stomach pain and diarrhea are common, as is irritability. Over time the gluten will destroy the lining of your small intestines, weakening the organ's ability to absorb important nutrients from food. Chronic gluten consumption could cause you to lose weight. If the consequences of celiac disease are ignored for too long the damage done to your organs can be permanent. Extreme allergies to gluten could resul in hives, itching, swelling, sneezing and rashes, followed by difficulty breathing, unconsciousness and even death, according to Drugs.com. If you are not able to drink malt beverages, there are still several alternatives. Certain alcoholic beverages do not contain malt, barley or other gluten-bearing products and are safe for people with celiac disease. Hard ciders that do not feature caramel coloring are safe, as are sorghum beers. If you are unsure of the safety of a beverage and/or whether it features malt in it, consult your doctor or a list of gluten-free foods.